best rolex replica The luxury-brand watch’s special style can aid your taste a great deal. Watch is a substantial accessory that you’re ready to have. On line watch stores provide time-pieces in lots of fashions and also carry on to supply their clients top quality products. Following Nintendo’s live stream of the Nintendo Switch presentation, many new trailers for several games have been released. One of those being ‘Sonic Mania’, a classic sonic game to be released for the Nintendo Switch this year. From watching the trailer, fans can see that the developers have gone back and taken inspiration from the old Sonic games, using simpler graphics compared to previously released Sonic games (which have had mixed reactions from fans). The game also emulates the original 2D gameplay, something the older Sonic series is known for, which has many fans supporting Sega’s decision to release the game. The trailer features new zones and three playable characters, those being Sonic, Tails and Knuckles the Echidna. The game is set to be released sometime in Spring, and also comes in a Collector’s Edition for $69.99. In other Sonic news, a second game is also been slotted to release near the end of this year, titled Sonic Project 2017. 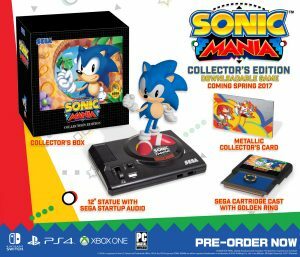 Little information is known about the game, however both this project and Sonic Mania are to be released on the Playstation 4, Nintendo Switch, Xbox One and Microsoft Windows.